The candidates for State Superintendent of Public Instruction held their first and only debate in Fort Wayne Monday. The candidates have similar viewpoints on policy issues, but differ on how they would lead Indiana’s Department of Education. 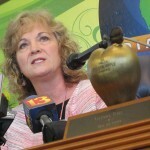 Republican Jennifer McCormick criticized the way her opponent, Democratic incumbent Glenda Ritz, communicates with Indiana schools. But Ritz says she gives weekly updates and travels the state every week to talk to school officials. McCormick says she would like to see more transparency in how Indiana calculates its disbursement of federal dollars. As an example, she cited last school year, when some schools received fewer Title I funds for low-income students because of a miscalculation by the Indiana Department of Education. Ritz says this happened before she became state superintendent, and said the Department of Education was transparent in fixing the problem. The two candidates agreed on many policy issues, including expanding the state’s pre-K program, changing the way schools and teachers are evaluated, working to attract and retain teachers, and replacing the standardized ISTEP exam.